The Pointer Selection tool is the basic tool for selecting shapes. This tool is used to quickly select all of the performers of a shape. The Pointer Selection tool only selects whole shapes. In other words, when you use the Pointer Selection tool you will get ALL of the performers in a shape. 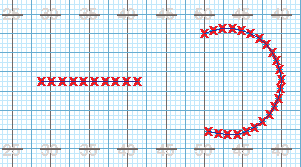 If you only want to select a portion of the performers in a shape, other selection and regrouping tools will be used. To select the Pointer Selection tool, click on the Pointer tool on the Tool Palette. *Double-clicking on the Pointer tool on the Tool Palette is the same as choosing Select Recent from the Edit menu. 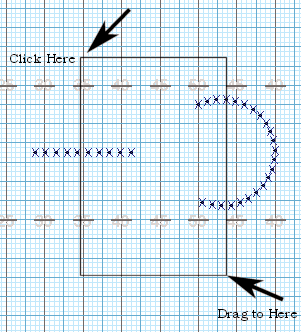 Clicking on a shape on the field will select all of the performers of the shape. When only one shape is selected, the Console will display the Average Interval of the selected shape in steps. To add another shape to the selection, hold the [SHIFT] key and click on another shape. Similarly, to remove a shape from the selection, hold down [SHIFT] and click on the shape you wish to deselect. With the Pointer Selection tool activated, dragging across performers on the field selects all of the shapes that have performers found within the drag region. Even if you only catch one performers within the drag region, the entire shape that the performer is a member of is selected. Holding down [SHIFT] while dragging across performers will add the shapes of the performers falling inside the drag region to the selection. Click anywhere on the field (but not a performer!) to clear a selection.